My final job for the end of 2005 was to put together a new 30 cal F class/Tactical competition rifle that would keep me shooting whilst I over hauled my old reliable 308 match rifle. I had fully intended to go down the 308 route again based on the if it anit broke, dont fix it rule but a quick inspection of gun cabinet showed that I would have four guns with the same chambering, so probably time to invent a new rule.. so what else can you do with a standard short Rem action and a 30 cal barrel?? An afternoon trawling the net showed that there were a few possibilities that would work on my Remington short action. The 30 BR, 300 SAUM and 300 WSM all are very good options but as I wanted a calibre with a ballistic performance to at least equal my 6.5x284 in both supersonic range and flatness of trajectory.. there was no competition the larger capacity case of the 300 WSM won out. The Winchester Short Magnum, or WSM, was developed in the early 2000s by the U.S. Repeating Arms Company, the maker of <?xml:namespace prefix = st1 ns = "urn:schemas-microsoft-com:office:smarttags" />Winchester guns, one of the oldest firearms manufacturers in the USA. All of the WSM cartridges are based on the 404 Jeffery, a non-belted magnum cartridge, but shortened to fit through a standard-length action. The WSM family of chamberings was inspired partially by John Lazzeroni, who had created a line of magnum cartridges. that were designed to operate in a short-action rifles, instead of requiring a magnum-length actions. And partly by a series of 6mm PPC and BR cartridges developed for bench-rest/target shooters in the 1970s. The theory behind these cartridges was that a short, fat cartridge would make for a quicker burn (relatively speaking) and therefore be more "efficient" than the traditional long, narrow cartridge, as more of the powder column would be in the immediate vicinity of the primer as it`s detonated. In short this would mean that a cartridge of this type would be able to propel a bullet at speeds comparable to those of "magnum" cartridges of the same calibre but using significantly less powder. The first problem which is immediately apparent when looking at the factory rounds is that the bullets are seated quite far back/deep into the case. As I intend to use BTHPM or VLD bullets in the 175g to 180g range this would mean the bullets would seat too deep back into the case, which means we would loose some of our prized potential powder capacity which is not good idea when we want wring the last drops from the case. So with the seed of an idea forming a quick phone call to Dave Kiff at Pacific Tool (reamer manufacturers) and it turns out that others over the pond have had the same idea and come across this same problem too. (there`s nothing new under the sun) but Dave Kiffs solution to the problem was simple and easy, by mealy re-drawing the reamer print and extending the lead over the original chamber design we can seat our bullets out further and regain all the useable case capacity of 79g of H2O, two weeks later our new match reamers arrived. The choice of high quality replacement barrels from the US and Europe is bigger than ever but while I was at last years Shot Show in the U.S. I met the world famous Highpower shooter David Tubb, david has won the NRA National Highpower Rifle Championships at Camp Perry an unequalled eleven times!! and he now designs and builds his own line of Tubb Highpower Match and Tactical rifles, to say that this guy knows a thing or two about what goes into the building and shooting accurate rifles would be the understatement of the century. So when during our conversation David told me that he has exclusively used Schneider barrels for the last 15 years and suggested that I should give them a try I needed no further persuasion. If Davids recommendation was not enough for me to try one, the fact that the US Marine Corps (who also know a thing or two about accurate shooting) build their M40 sniper rifles exclusively on Schnider barrels. The barrel I settled on is 27 inch stainless steel, 1x11 R/H P5 (polygon 5) twist, the profile is garys number 7 which is the contour used on the USMC M40 sniper rifle. Finally as the 300 WSM is a quite potent little round, the one thing that I new this rifle will benefit from is a good muzzle break to help tame the recoil, The theory behind muzzle breaks is that they tap the rapidly expanding propellant gases and re-direct them away to usually at 90 degrees to the axis of the bore, this has the effect of reducing the felt recoil and taming the muzzle climb. 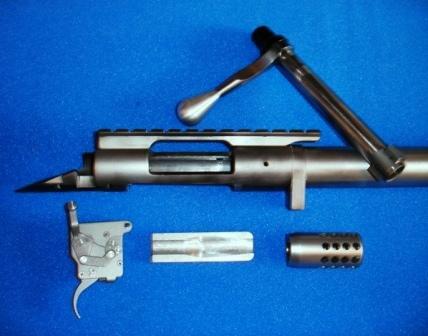 I have experimented with lots of different types and designs of breaks over the years and one of the best of these items ive come across is produced by Vais Arms Inc of Texas. Each is made to individual order on CNC machines and the customers barrel dimensions and threads can be matched there is also enough meat on the O/D of the rear of the break so you can taper it back to blend into the barrel O/D if required. One further note whilst on the subject of breaks, when you choose one try to avoid one that has a large void inside, this is because the gas that escapes from behind the bullet as it exists the crown is moving faster than the actual bullet. And whilst inside a break with a void the gas can overtake and get in front of the bullet, you then have a situation where you bullet may have to pass through its own muzzle/powder blast which of course could cause bullet instability. In short for a Muzzle break to be effective it should have whole up it that is only a few thou larger than the bullet, and lots and lots of evenly spaced ports to tap of the gas. Then get it fitted by a professional gunsmith, a DIY error or sloplyness whilst cutting the threads and all your hard work and money could go out the window. The estimated loaded length of our Match round is 2.98 so the magazine on the Rem action is no use to us, So a benchrest single feed Blind Follower is required to allow for single feeding which in this case this is a good thing. When the follower is fixed in place with Devcon (steel cement) and then full length bedded into the stock it will help stiffen up the action. Its not commonly known but actions with large ejection and magazine ports do reduce the overall strength of the action which can flex under firing, this could affect our accuracy so anything that we can to reduce this is a good thing. If you want to go down this custom route my advice would be to fit a Magnum recoil lug and a one piece steel scope rail (both used on this project are from Badger Ordnance) the fixed follower is an added bonus and makes this particular action as strong as we can get it. Failing this you could make life a whole lot simpler by ringing RPA and ordering a Quadlock action!! 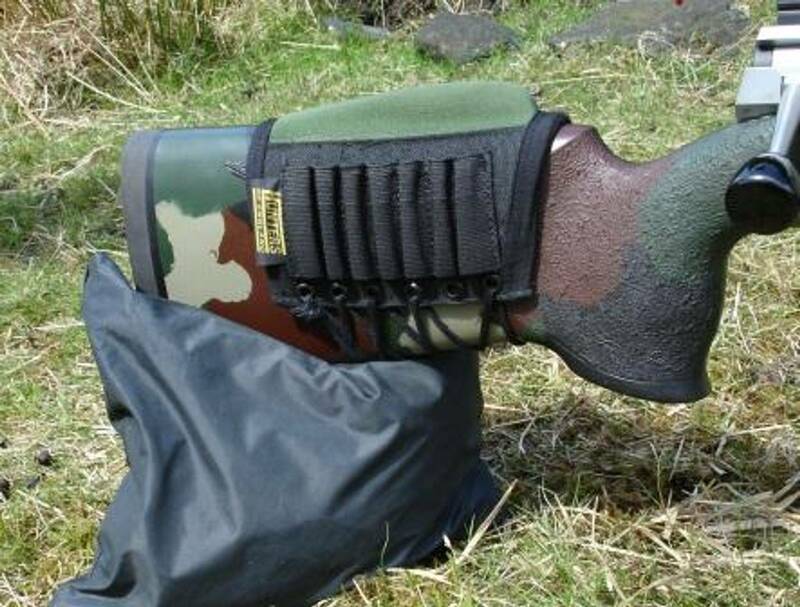 This is a appropriate time to talk stocks, and lets face it theres only one, its got to be a McMillan, probably the best after market stock there is bar none, so the choice of this A4 Tactical was a no brainer but McMillan do lots of little extra goodies that you can have fitted to you stock. My favourite of all these is the Michaels Push Quick realise swivels, these are very clever little gadgets that allows you to fit and remove your sling in seconds. I always fit these to the flat offside of the stock so that when you carry your rifle on your back the bolt or scope turrets dont dig into you back. Finally even the best stocks sometimes need a little help to raise the shooters eye to the correct height for todays large objective scopes so a Snipers Cheekpeice by Hunters Of England was used. The more observant amongst you may have noticed that I have Devcon bedded along the action and beyond the recoil lug to a full 3 inches under the barrel. There may be some people reading this that have just fainted but I will explain why I do this. Firstly this barrel weighs in around the 6 lbs mark which is a lot to hang of 1 inch of Rem action threads plus I will be using a Reflex T8 sound moderator which is another 1lbs so theres a lot of weight hanging of the action that in my opinion needs some support. This added support also helps reduce any point of aim / point of impact changes with moderator on/ off. I can still here mutterings about barrel harmonics, but as long as you use a torque wrench to re-set action bolts if you have to remove the action from the stock the harmonics will be just as constant as if the barrel was free floating. I have used this method on many rifles and I can promise you if you have a good stock that doesnt flex and a good bedding job it will shoot every bit as good as a fully free floating barrel. The final obstacle to be over come was the question of the bolt, the problem being the bolt face of the 300wsm is somewhat larger than the standard 308. So seemingly there is only one avenue to go down, that is to re-cut the bolt face to accommodate and then fit a replacement Sako extractor, this is all very well but one day you may want to re-make the rifle back to the original calibre plus the cost if this extra work could be in the area of £180. The alternative to this problem is easier, cheaper and down right better is to buy a complete replacement bolt. Pacific Tool make a replacement Remington bolt body and there own version of the bolt handle (which as can be seen is much longer and easier to handle/operate and has the look of a Neseka Bay handle). They also give you the choice of firing pin assemblies from basic units to top of the line which is make from pretty exotic materials and gives a lock Time performance equal to the best bench rest actions, once again all this helps us wring the last drops of performance out of the old girl. With all the bits and pieces in place its time to hand over to the alchemist of the gunsmith, in this case Pete Walker of Walker Custom Rifles, pete`s attention to detail is both frustrating and gratifying. Frustrating because he doesnt cut corners and that means jobs take time and everybody hates waiting for jobs to be finished.. and gratifying because when you own a custom rifle built by pete you can rest easy in the knowledge that it will be the best rifle it can be. Pete had to work with several unknowns on this project i.e the polygon rifling and replacement bolt, which all through up various problems but pete finished the job on time and to his usall high spec. Theres not much to go at in the brass department for this chambering yet Norma, which is expensive and of course Winchester. Winchester brass is ok but not in the same league as say Lapua (gap in the market here boys!) so to bring the concentricity back up to required levels for match shooting I did have to skim all the necks with a neck turning tool from Sinclairs the same went for the primer pockets and flash holes to. This is an exercise I dont usual do but I was surprised how much difference there was between the thickness of brass at the mouth of some of cases, so evidently it was a necessary job. Bullets, well there are bullets galore in 30 cal but my favourite match bullet is the 178, Hornady A-Max (30712). 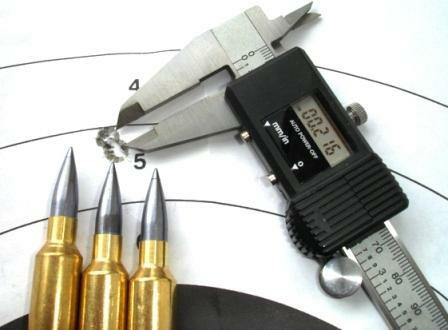 I have used this bullet exclusively in all my 30 cal rifles for the last 6 years and have seen nothing to beat it, its heavier than average weight means if fights the wind better than most and the polymer tips hard to damage and gives a good BC of 0.495. Hornady bullets also seams not to be to fussy so far as the rifling twist rate goes ive seen these particular bullets perform equally well in 10, 11, and 12 inch twists. Powder, (usall safety notice applys here, start low and work up and if in doubt ASK SOMEONE. but most of the slower magnum type powders could be used RL19-22 as well as Vit 160-165 and 560. The 178g A-MAX has a good long bearing surface and therefore is a excellent candidate for Moly coating. I moly coat all my bullets and therefore a degree of fine tuning with loads is required, but a good rule of thumb ive found to be true is once youve got the correct powder and measured the bullets OAL to the lands if you then seat your bullets 3-6 thou back to allow for the jump the bullet base should be sat just on the top of the powder. The velocity charts (courtesy of Quickload) show there is only a 148 fps advantage in the 6.5x284 over the 300WSM at 1600 yards, which is some going for a bullet that is 39g heavier than the 6.5. The proof of the pudding is in the firing, but ultimately any rifle is only as good as the person using it. My break in groups averaged sub ½ MOA the best being 0.233 (centre to centre) at 100 yards that was from a cold clean barrel, but in order to realise its potential I moved back to 300 yards. And even in less than ideal weather conditions it turned in average groups of 0.75 inches which is no less than I would of expected given the work thats gone into it. So you have built a rifle thats one of a kind then why have it looking like everyone elses rifle on the firing point? Heres were even the most ham fisted and un artistic can have a go, a few cans of spray paint and a bit of thought and some careful masking and you have a truly individual looking rifle and hopefully some may even say a work off art!! By way of a change I opted for a desert camo type design which was quite easy to do and was completed in a only a few hours, the bonus of this method is, if you get bored of it just spray over it and start again you are only limited by your imagination. The camo tape used on the scope is a useful little product it doesnt leave any sticky residue because it sticks to itself and can be re-used on anything repeatedly. When you stand back and survey the rifle from a performance perspective in the Match version you have a tool that will throw a heavy 30 bullet out at speeds up to and equal with a 300 Win Mag, So no problem competing with any of the larger calibre rifles in any competition on range days. And from a hunting angle there are lots of expanding bullets that could used for the varminters, but to be honest its probably to much gun for most UK pests. As for any of the larger British game if you exchange the 178 Hornady for a Norma Silver Bullet or similar of the same weight you get a MV at 100yds of 2776 which is 3058 ft.lbs so no problem for even the biggest deer or as a hog stopper. Either way whether your needs are for Match or Meat take a look at all the WSM and WSSM chamberings which can provide Magnum performance in short action rifles.